Anti-Ageing Foods You Need To Add To Your Shopping Trolley! So we all know that eating a balanced diet of healthy foods including “good fats” is the way forward. Did you know that there are 9 foods that you should be eating on a weekly basis to aid younger brighter skin and slow down premature ageing and here’s why! 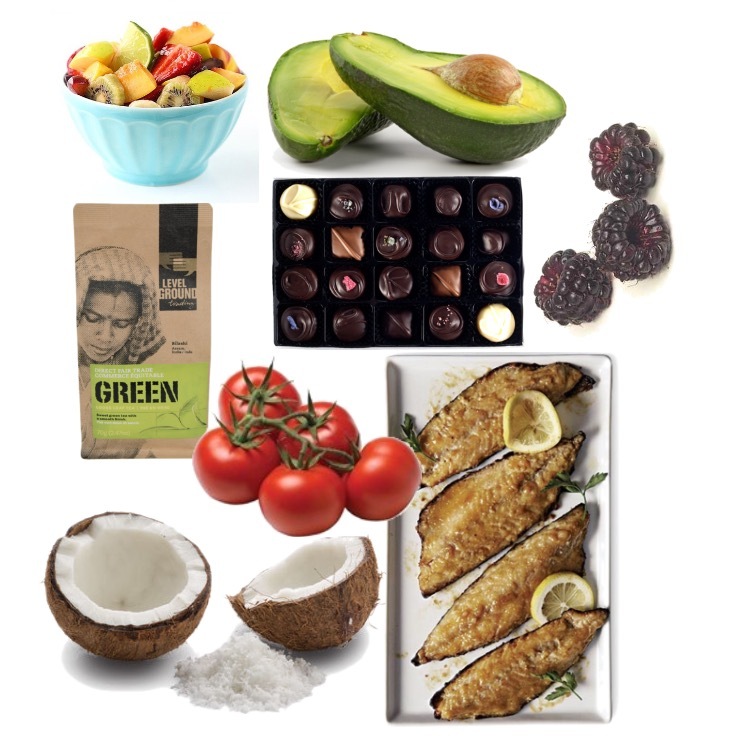 1.Avocado (the king of instagram #foodporn) High in Vitamin E which is a skin saviour. A healthy fat that lowers cholestrol and great for keeping your joints supple. Helps to prevent premature ageing of your skin and damage to your DNA. 2.Fruit (avoid sugar loaded tropical fruits) High in Vitamin C to promote a healthy glow, our bodies do not store Vitamin C so the more you can eat the better. 3.Berries Bursting with Antioxidants which have a positive effect on slowing down your skins ageing process supporting collagen formation keeping your skin nice and plump. 4.Dark Chocolate (85% cocoa) Cocoa is very high in oxidants helping to protect skin from harmful UV effects, eat moderately and always choose organic. 5.Tomatoes Contain lycopene which has been proven to be anti-ageing to the skin. 6.Fish Fresh Oily cold water fish is the best source of omega-3 a fatty acid which supports healthy skin and immune function. 7.Coconut (the dharling of instagram) The health benefits are endless (another blog post right there) however when talking of the benefits on your skin for eating coconut this medium chain fatty acid has been shown to significantly increase skin elasticity and decreased wrinkling of the skin. 8.Green Tea An antioxidant which has anti-cancer properties and aids weight loss, highly effective on our skins complexion and overall good health. 9.Leafy Green Veg Acting like an edible elixir of youth! Benefits to our skin colouration in a way that others find attractive, also another anti-cancer ingredient. Two great reasons to pile your plate high with spinach, broccoli or kale. What are you going to add to your weekly shop this week?